For photographs of Annie, click here. NOTE BY EDWARD KEENAN: "Annie Jane Keenan was the youngest daughter James and Maria Keenan of Glenone, co.Antrim, and looked after her mother after the rest of the family had departed. She corresponded with the W.A. Keenans for a number of years until they appeared to lose contact due to unknown reasons. On March 2nd 1955 Annie Jane again wrote to the Keenans in the hope that some of the cousins would still be alive. The letter, addressed to her uncle Stewart Keenan, and his three sons who were all living at the last time she wrote, was delivered to a remaining family member ten days after she posted it in Ireland. From this an exchange of letters ensued over the years until Annie's death in 1968. Annie married McKay, sixteen years older than herself and had one son. The following letter was the last one known before the early correspondence ceased." If you only knew the pleasure and joy it gives me to answer your welcome letter which I received and so I hope you will excuse me for being so long of writing to you for I was not intend to be so long. But I have put in a terrible time this while with the toothache so I had to give in at last and get two out. But I think by the time mother wrote you should almost have it by now. So dear cousin I hope you wont look to me to me being long of writing for indeed you don't know how proud we are to get a letter and to hear how father and mother is getting along,. I and mother are very pleased to know that both have such good health, it is much to be prized. But you say fathers eyesight is failing, of course that is not to be wondered at of his time old age of course. health myself. I am troubled with indigestion so I'll be thankful if you can send me a cure, it is a terrible affliction, some people tells me there is no cure but get married, so if this is to be the case I should think I'll have to suffer a long time yet. Dear cousin, you want to know if Brother David is still in the same place this long while. Well as far as I know he and his wife have been in the one place this long while, but perhaps it may not be the same now as when last you heard. However I will give you his last address. I may say also that I have a sister beside him, Margaret Bell. Her address is Mrs Robert Malcolm, 170 Allston Street, Providence, R,I., U.S.A. David’s is, Mr David Keenan, 48 Andem Street, Providence, R.I., U.S.A.
Now dear cousin as I have come to the last page I must in a sort of a way draw to a close, but before finishing up I must say I am still waiting patiently for the cards which you were to send me, so dearest friend, as I said before I hope you wont be long in answering this letter for I'll want to write to you soon again, so I'll conclude at this time with best regards from all to all, not forgetting father and mother, from your unseen friend Annie to cousin Minnie with every good wish and goodbye for the present and please do not be long of writing. Glenone, Port Glenone, Co.Derry, Ireland. NOTE BY EDWARD KEENAN: "This is a copy of the final letter available from Annie McKay before the big space of forty-one years when correspondence appeared to cease between the two families." Once again I am pleased to hear from you. But mother and I are sorry to hear of the old people getting so feeble, but it cannot be otherwise expected, old age will come. Dear cousin I may say that I had a letter some time ago from cousin Annie and she asked me to persuade mother to have her picture taken and send it, so this is not a very good one. She is letting you have two so that you can send father and mother one. I am also writing to cousin Annie today. Dear cousin you seem to have a lot of work to do. I wish I was with you to help you to wash and cook and churn then it wouldn'y leave you so much to do. But as you have already said some of the boys should get married. Cousin Annie said in one of her letters to me that cousin Willie was talking about coming over to see the old country. So please tell him if he comes I shall do my best to get him a wife so that if he wouldn't be too hard to please. When I get word he is coming I shall be on the lookout till he lands. Dear cousin I am sure that father and mother feels it very much more even so as they get older to be so far from the old country of which they were reared, but as for any of the old people of which he talks please tell him they are all dead and gone and as for the Milltown people I think he speaks they are all gone also only that they are a son married and in the place. With the exception of your mothers brother he is the only Gamble about the place and still lives in the Moss as we called it, his wife is dead over thirteen years ago but they are a daughter lives with him single though getting up in years, almost 40 years of age. Dear cousin I said out of ten I am the only unmarried one and I think shall be for some time although the one you speak of on the P.C. was a sweetheart but not now, although I see him often. But as for my wedding day I think it shall never come my length. However I have lots of time yet and as the old saying runs there might be luck in leisure. Now dear Cousin I shall only be too glad to do anything for you I possibly can with pleasure and wont be doing you any favour in the least. So I shall go away to our minister tomorrow and speak to him about it , he may not be able to produce it for a few days and so would have to wait. But I wont delay I shall do my part at once…..NOTE BY EDWARD KEENAN: "The letter stops here as the final page was apparently lost. It is not quite clear what she means in the last couple of paragraphs." 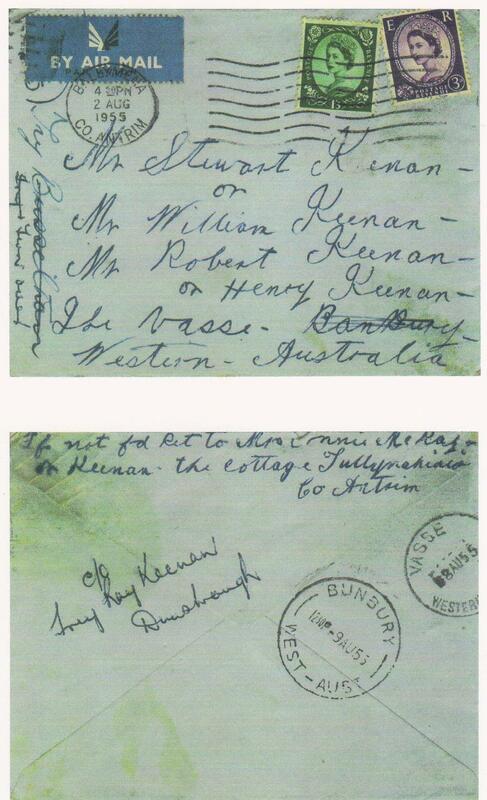 NOTE BY EDWARD KEENAN: "This is a copy of the first letter that Annie McKay (Keenan) wrote in search of family members in Western Australia. She kept up a correspondence with the Keenan girls until they passed away one by one. Annie herself, died in 1968." When if this letter goes your length yous will wonder who it is from, and then indeed I don't know who I am writing to, but I think I can let you know soon who I am. My father was James Keenan and your mother was Isabella Gamble before she was married to my uncle Stewart Keenan and your mother was my lawful ant. (aunt) But they are sure to be dead years ago. I have just discovered lately a cutting out of some paper and it has led me to do this and I think it must be some years past telling where my ant was born on January 2l year l833, and my ant your mother or Granma, or perhaps Great Granma, was married January 1859. The little bit of scrap paper says she and her husband arrived at the Vasse in January 1860 and the word Vasse was then named Banbury. NOTE BY EDWARD KEENAN: "Annie is a little confused here. In actual fact the name Vasse was afterwards changed to Busselton". It then says that my ant was 96 years old, that would leave her a considerable old woman now, and so would my uncle Stewart or your Granda. NOTE BY EDWARD KEENAN: "The paper cutting in question must have been concerning Isabella Keenan's death as she died aged 96." I would love to hear from yous. My father died in year 1906 and my mother lived 31 years after (father wasn’t 60 years old when he died) but mother was 91 years. Now for the names off our family, Elizabeth Keenan, Margaret Bell, James, Henry, Robert, David, Stewart, Willie, Samuel and myself the youngest of the lot is now 67, my name was Annie. But all these others are all dead, only myself. My brother Stewart died in Australia, Elizabeth and Margaret Bell died in America and all the others died in Scotland, but of course my youngest brother Samuel was killed in the war in the Battle of Mons. Everyone was married and had families. I stayed with mother after father died. I was then only 18 years. Then I got married when I was thirty eight. My father's mother was Gamble and now surely there is some cousins or someone’s family still living. I often heard my father tell after uncle Stewart and ant Isabella left Ireland that uncle wanted father to clear out and go also, but as far as I can follow Granma was still living and so kept father back. And now honestly I cant say who will get this letter. It could be cousin Willies family or Robert or Stewart. At any rate I am Annie Keenan, though I am married I still love my old name. The Cottage, Tullynahinnion, Co. Antrim. Only 2 1\2 miles out off Port Glenone. So whoever gets this cheerio and God Bless you all.